Avoiding the Bull Market Glide Trap: Is Your Plan’s Target Date Solution Taking Too Much Risk? It’s been over a decade since the Department of Labor (DOL) issued guidance on Qualified Default Investment Alternatives (QDIAs). Target date funds (TDFs) quickly became the favored QDIA choice for their ease of use and ability to help address well established participant behavioral challenges. Just as TDFs started to gain traction in the QDIA role, the global financial crisis hit and erased significant wealth for a wide range of investors, including participants using TDFs. 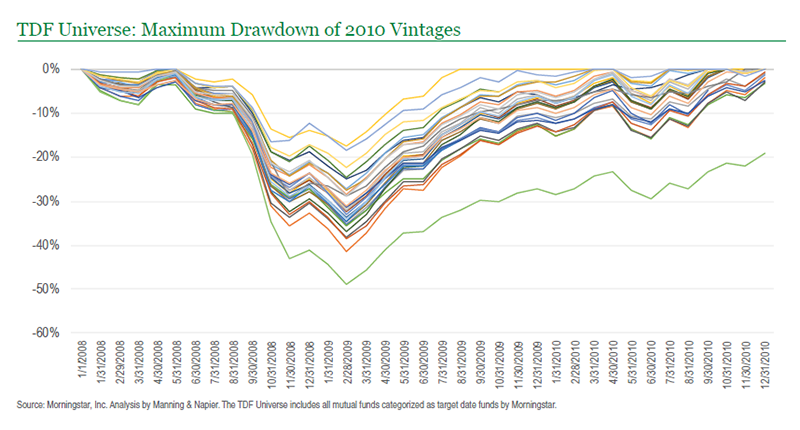 Even those invested in 2010 funds—vintages that should be fairly conservative given how close they were to their target year—saw losses as severe as -49%. The range of losses among TDFs during this period of time, illustrated below, highlight the fact that there were material differences in investment philosophies and objectives. As importantly, it also brought to light the need to ensure a plan’s TDF solution provides a good fit for participants through both good and bad times. In fact, during 2013, the DOL issued guidance in selecting and monitoring TDFs, urging plan fiduciaries to fully examine the principal strategies and risks of a prospective provider’s approach to TDF investing. The nine plus years since the global financial crisis have been a more favorable environment for participants, characterized by strong returns and extraordinarily low volatility for equities, propelling average 401(k) balances to record levels. There are important implications of this market environment for plan fiduciaries as well. Since due diligence programs are commonly based on standard trailing time periods, such as three and five year intervals, today’s performance snapshots are bull market biased. In fact, given the duration and magnitude of this bull market run, the trailing 10-year time period may soon reflect a one-directional market environment. While providing adequate growth during upward trending equity market environments is a critical aspect of helping participants reach their long-term objectives, it is important not to lose sight of the impact capital losses can have during market downturns. Drawdowns are disadvantageous from a mathematical perspective as a greater gain is needed to offset a loss, but they are also impactful from a behavioral standpoint. Behavioral finance insights over the past few decades have made it clear that participants who are invested more aggressively than their risk tolerances dictate are more likely to engage in damaging yet avoidable behavior, such as selling their investments at unfavorable prices during market downturns and buying back in only after the market has rebounded and appreciated significantly. As a result, participants may have a more difficult time staying the course and ultimately achieving their retirement goals. Assets in TDFs intended for participants nearing or in retirement have swelled. TDF assets have grown significantly since the global financial crisis, surpassing the $1 trillion mark in 2017. With assets in TDF vintages nearing or in retirement experiencing an increase of over 800% since 2007, the next market downturn may have a much larger impact on this group of participants that can least afford to suffer significant losses. Source: Morningstar, Inc. Analysis by Manning & Napier. The TDF Universe includes all mutual funds categorized as target date funds by Morningstar. Data is as of 12/31/2017. *Defined as vintages within 10 years of their identified target date. TDF assets are concentrated in higher equity glide path providers. Of the growing TDF asset base, our analysis indicates that 81% is invested in five TDF families. While there are likely many reasons that these TDF providers have been successful in growing and/or retaining their market share, a notable commonality among them is that, on average, they are governed by higher equity glide paths. Due in part to their glide path positioning, these TDFs have, on average, outperformed more conservative counterparts during this extended bull market run. However, during an equity market downturn, TDFs governed by higher equity glide paths may have difficulty meeting the needs of risk averse participants, as well as those that are relying on retirement assets to support daily living expenses. Consider that during the global financial crisis, the five 2010 funds with the highest allocations to equities lost, on average, over one-third more than the remaining funds within their peer group. Source: Morningstar, Inc. Analysis by Manning & Napier. The TDF Universe includes all mutual funds categorized as target date funds by Morningstar. Participants have expressed their desire for downside risk managed solutions. When determining an appropriate approach to target date investing for a plan, it’s important to keep participant needs and views in perspective. For example, a recent industry survey1 highlighted that 77% of investors said they support managers’ protecting their portfolios from losses, even if it results in periods of underperformance. Individuals across all age groups shared that sentiment, but it was especially true among the oldest respondents. This decade has provided a generally favorable market backdrop for participants to build and spend down their retirement wealth. History has shown, however, that the risks and opportunities within capital markets inevitably change over time. This doesn’t suggest a bear market in equities is imminent, but it does suggest the potential for lower returns and increased volatility going forward. Plan fiduciaries should be diligent to look beyond bull-biased trailing time periods and incorporate additional metrics such as maximum drawdown and downside capture ratios to evaluate a TDF manager’s ability to protect retirement assets during periods of market duress. By adopting a well-balanced due diligence program that considers a manager’s ability to both grow and protect assets, plan fiduciaries can further document that the chosen TDF solution is structured to meet the needs of their participant base through a variety of market conditions. Manning & Napier Investor Services, Inc. is a member of FINRA. Morningstar, Inc. is a global investment research firm providing data, information, and analysis of stocks and mutual funds. ©2018 Morningstar, Inc. All rights reserved. The information contained herein: (1) is proprietary to Morningstar and/or its content providers; (2) may not be copied, adapted or distributed; and (3) is not warranted to be accurate, complete or timely. Neither Morningstar nor its content providers are responsible for any damages or losses arising from any use of this information, except where such damages or losses cannot be limited or excluded by law in your jurisdiction. Past financial performance is no guarantee of future results.